Quality products and safe installations are important to us. The windshield is an integral part of the structure of your vehicle. Promoting awareness of the AGRSS® Standard to the insurance industry and driving public at large. The Automotive Glass Replacement Safety Standards (AGRSS®) Council Inc. (AGRSS®) is a not-for-profit organization dedicated to the safe replacement of auto glass. AGRSS® was founded and is supported by companies in the auto glass replacement industry that keep safe installation as their primary goal. AGRSS® is an accredited American National Standards Institute (ANSI) standards development organization. It has developed the North America's only auto glass replacement standard, the AGRSS® standard (ANSI/AGRSS® 002-2002 Automotive Glass Replacement Safety Standard). TheAGRSS® Standard addresses procedures, education and product performance. The Auto Glass Safety Council has announced that Crystal Clear Windshield Repair and Auto Glass successfully completed an on-site independent validation audit of the company. 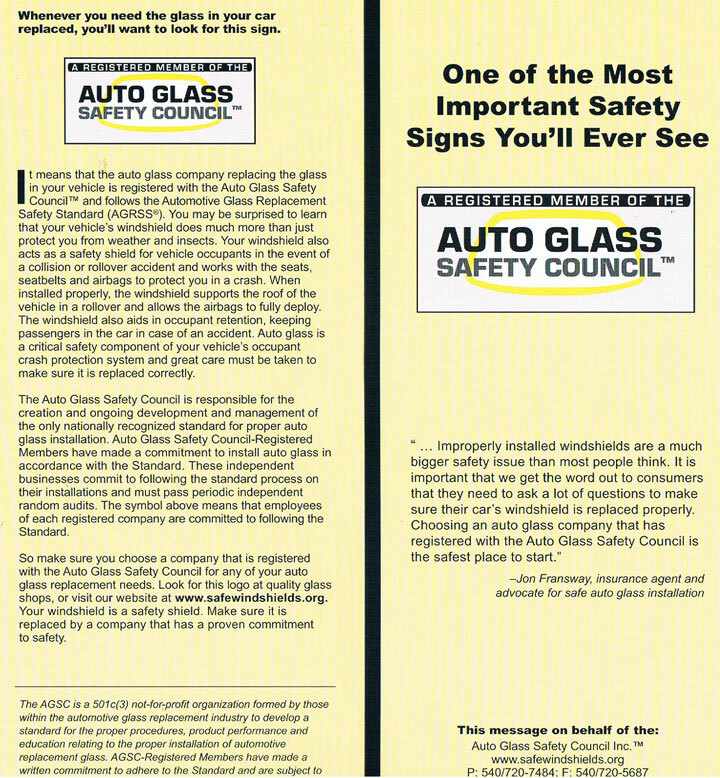 The Auto Glass Safety Council is a not-for-profit safety group dedicated to the proper installation of replacement auto glass. It publishes the ANSI/AGRSS Automotive Glass Safety Standard and manages a rigorous registration program whereby quality auto glass service providers agree to follow the standard and submit to random, independent audits on an on-going basis. Crystal Clear Windshield Repair and Auto Glass is locally owned and operated and has been in business here for over 20 years serving Summit and Eagle counties. It is the only AGSC-Registered Member company in Summit County.